I don’t think these folks are Democrats, but it’s hard to tell if they are Republicans. Not only do they have bold, blue signs, the word Republican doesn’t seem to be appearing anywhere at all. The biggest puzzle, for me, is Scott Brown. If my name was Brown, I might want to play off that, reinforce the message, and use brown bumper stickers and signs. But we’re not a Brown state, we’re a blue state. After last night’s US Senate debate, Barney Frank said, “You couldn’t get Scott Brown to say Romney with a subpoena.” You couldn’t get him to say Republican, either. Perhaps we can help. Can we get some red stickers with the Republican elephant logo and attach them to some of these lawn signs? Maybe we could go around replacing the defective blue Brown signs with red ones, bright red signs that also say Vote Republican. Or, we could get some Mitt Romney signs (those are also blue) and start planting them next to each and every Scott Brown lawn sign. Even better, we can print up red signs that say, VOTE REPUBLICAN – MITT ROMNEY & SCOTT BROWN. Unite the ticket. Create some synergy. All we need are some anonymous donations to social welfare educational organization. Anyone want to donate some big bucks to educate the voters? Not sure why you wasted your time. 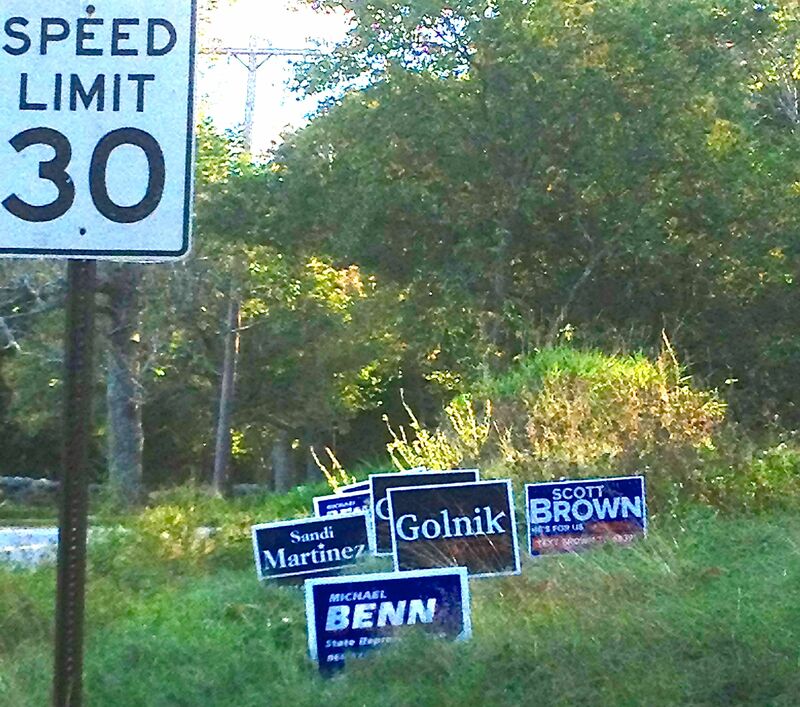 Campaign signs are all different colors. Brown’s and Golnik’s are red, white and blue. Gee, I wonder where they got that idea? Try finding a Democrat (other then Frank Moran of Lowell, who doesn’t have a Republican opponent) who actually puts Democrat on their sign. Most Democorats don’t put “Democrat” on web sites, push cards, anything. You think that would be a great idea in this state. Why don’t they? …is a candidate for 17th Essex, which is Lawrence. The Lowell delegation are all seeking re-election.